Here is a pretty decent link Revi posted on another thread. It explains how demand destruction can cause falling oil prices in early stages of collapse. Broken link, Newf. It says "Bad Request" when I click it. Thanks, I fixed the link above and repeated it below. The EIA reports a new monthly world oil production record in October 2018 of 84.06 mb/d. Newfie wrote: Here is a pretty decent link Revi posted on another thread. It explains how demand destruction can cause falling oil prices in early stages of collapse. On the other hand, Gail Tverberg isn't exactly a fount of accurate predictions, now is she? Gail Tverberg isn't exactly a fount of accurate predictions, now is she? While Gail failed to predict the future she was right in line with mainstream thought in the PO community. Fortunately for most of us we were very wrong and fracking really did grant a massive reprieve to our culture. The problem as I see it is many people now accept the idea that Fracking 'solved' everything and we can keep on growing forever. Now we are back to getting fairy tales, with the doom crowd saying crash is imminent (as always) and the corny's claiming depletion issues is now again at least a generation in the future. No doubt the truth is somewhere in the middle with continued world growth placing ever more burden on oil production day in and day out. We get folks pointing to headlines about a decrease in the growth rate of China as if that meant they were in a shrinking economy. That is the same kind of nonsense as saying a federal budget deficit of 250 billion a year is a huge improvement over 255 billion a year. Reality check, Demand in China is still growing. India is still growing. Indonesia, Turkey, Thailand, all still growing as are most of South America and Africa. IOW world oil demand is still growing at north of 1 MM/bbl/d/yearly. Even if the Fracking Miracle keeps going for the next 20 years the only place so far that has had great success has been the USA because of the way our industry is structured. That doesn't prove anything, Argentina, Russia and the UK are all toying with entering the fracking of tight formations foray and they could all be wonderfully successful. Or they could be like Poland and California and turn out to not have much success. Only time will tell. However even if everyone gets on the Fracking bandwagon and has success like Texas that just delays things a bit. If all the fracking resources of the USA are 58 billion barrels of oil equivalent and we are now producing them at 6 MM/bbl/d and we hold that level we could produce for 25 years. Do you believe we have 58 billion barrels of frackable and recoverable shales? I do not, personally, believe that. The EIA as of last September estimated world tight oil reserves that are 'technically' recoverable amount to 425 Billion bbl. The problem is technically recoverable just means of we follow the process we can squeeze out some result, but it says nothing about the economic viability of doing so. So sure the USA may have 58 billion barrels of technically recoverable oil, but how much of that is economically viable? Half? Eighty percent? Twenty percent? Fracking is such a new technology that the truth is nobody really knows just how much of that technically exploitable oil is economically exploitable as well. The EIA as of last September estimated world tight oil reserves that are 'technically' recoverable amount to 425 Billion bbl. The problem is technically recoverable just means of we follow the process we can squeeze out some result, but it says nothing about the economic viability of doing so. So sure the USA may have 58 billion barrels of technically recoverable oil, but how much of that is economically viable? Half? Eighty percent? Twenty percent? Fracking is such a new technology that the truth is nobody really knows just how much of that technically exploitable oil is economically exploitable as well. The answer to that depends on what year and what price. We can assume the technology will keep advancing and as other supplies decline in the face of increasing demand the price will tend to rise. So in say 2035 we might have oil at better then $300/bl 2019 dollars and drillers will be happily using the latest tech to redrill and squeeze out a profit from fields we have already abandoned at today's tech and price. Of course if I'm even still around then I'll probably be strapped into a solar powered robot controlled wheel chair. Yes, and unfortunately the middle doesn't create enough online drama so it's not a popular position to fight over on a forum, but it perfectly explains the lack of activity in a hangout like this. 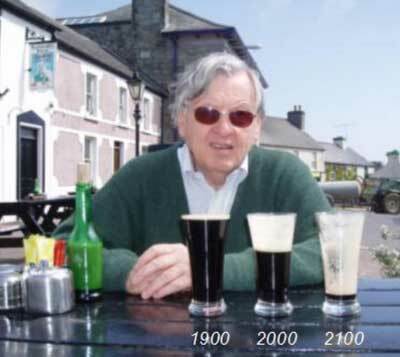 The normies long ago hit the snoozebar and got on with their life. If the situation were so dire, this place would be jumping instead of being propelled by a discredited crank who won't pay up a lost bet. By 2025 expect a wide assortment of $30-40K long-range BEVs with VW-group probably leading the charge, and that's assuming Tesla implodes Enron-style. If gas prices creep upwards expect buying habits to reach an abrupt inflection point where they simply abandon ICE and switch to EVs. It hasn't happened yet due to chicken and the egg issues, limited charging infrastructure, high prices, limited choice/volume, etc... Once all of those problems are addressed then buyers will make the switch just like they did when any new technology finally hit its sweet-spot. 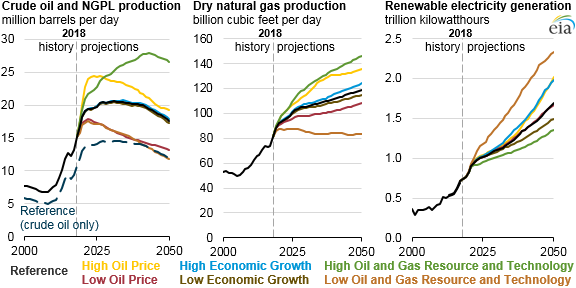 So I see the most vulnerable period for peak-oil doom being maybe the next 3-5 years. If we don't fall off a shark-fin cliff by then we will enter into that BEV buffer-zone. And again, it's provisional. If oil supplies remain plentiful then EV adoption might lag for a while. But the foundation will still be laid down. Chargers built, battery plants setup, cars crash-tested, autonomy evolved, etc... Once the industrial capacity is in place then the market will be able to respond. If that's the case then it's unlikely that oil will be $300/bbl by 2035. It might without any displacement, as would be the case in that 2008-style world that doomers are still permanently inhabiting, but not in the most likely future. While Gail failed to predict the future she was right in line with mainstream thought in the PO community. Puhleeze. 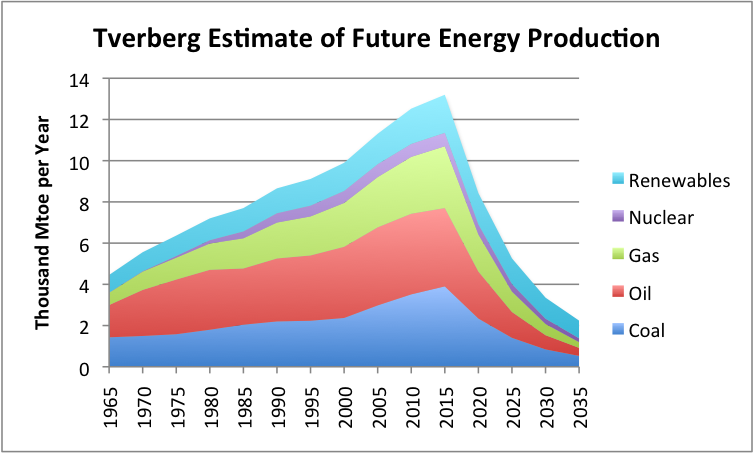 Tverberg's graph (energy, not oil) was drawn 5 years ago, after The Oil Drum closed shop. You can back the EIA reference case, Rystad Energy Ucube , David Hughes or the ETP SOB. Take your pick. Gail is a weather vane. She sits there, pointing towards whatever the hysterical journalism is of the moment, and when the wind shifts, so does she. T – The problem with that “reprieve” is that it came at a cost: $90+/bbl for oil. Let’s not forget the frac’ng tech that started the shale boom had existed for 10+ years before the boom began. And we knew the oil was in the shales for many decades. The boom increased proportionally to increases in oil prices. The price bust subsequently killed the boom. Recent price increase brought life back to the shales but we’re still a long way from 1,800 rigs drilling, eh? It still amazes me that so many believe life in te future will, at times, be very different then periods we’ve experienced in the past. Future and past periods when oil prices will spike upwards AND when they will collapse as economies expand AND contract. Long lines at gas stations post PO? We had those more then 40 years ago…long before any global PO. Global economies crippled many decades ago by high oil prices…again long before a GPO. And good economic growths during relatively low energy price periods. No reason not to believe same dynamics won’t be in-place after GPO. Maybe the world will reach a point when max oil production is 20 million bbls less then today. But if global economy is in the toilet at that time oil prices could be lower then they are today. Prices are not just a function of supply: demand has a huge impact on prices. Some folks seem to forget that. ROCKMAN wrote: The price bust subsequently killed the boom.....we’re still a long way from 1,800 rigs drilling, eh? The important metric here isn't the number of rigs but the amount of oil being produced from US shale. And that number is at an all-time high and still going higher. ROCKMAN wrote: Future and past periods when oil prices will spike upwards AND when they will collapse as economies expand AND contract. Long lines at gas stations post PO? We had those more then 40 years ago…long before any global PO. Global economies crippled many decades ago by high oil prices…again long before a GPO. And good economic growths during relatively low energy price periods. Years ago I saw a graphic put together by Colin Campbell (who hopefully is enjoying his retirement now) that showed the "future" as a big spiral going back and forth between periods of high oil prices and low prices as the global economy oscillated between periods of growth and recession. Campbell was one of the main proponents of "peak oil" but his vision of the future was not a calamitous abrupt collapse but instead a dynamic process operating between the economy and oil prices much like the past, but superimposed on a slowly shrinking global output of oil. I think you and Campbell more or less agree on this, eh? Polyethylene hit it's lowest price since the recession. Most PE and feedstocks come from nat. gas liquids, a smaller portion comes from oil refining but nat gas liquids are of course counted in the "all liquids" category touted as disproving PO. So a strange side effect of peak oil, at least currently, is the boom in LTO and fracked wet gas is causing a glut in the virgin plastics market. The knock on effect is recycling plastics is no longer profitable. The environmental effects that entails are obvious since if it ain't recycled it goes in the landfill or incinerator. Butler noted that while PET and HDPE had decent domestic markets and stable pricing, the shale oil revolution and its impact on oil prices and the new virgin capacity expected to come on did not bode well for plastic recycling and recycled plastic pricing over the longer term, and she saw a long haul of low prices. China effectively barred imports of recycled plastics in response to the non-trade war tariffs, not sure weight of each factor in the halt in recycling. I did see while roaming around that China imports of virgin PE were up, replacing the banned recycled plastic. Pops, I have heard talk around the water cooler about recycling not being worthwhile anymore but I hadn't made the connection to shale gas. I guess I should start collecting all of those plastics for when those decline rates catch up with the drillers. GoghGoner wrote: Pops, I have heard talk around the water cooler about recycling not being worthwhile anymore but I hadn't made the connection to shale gas. I guess I should start collecting all of those plastics for when those decline rates catch up with the drillers. I expect that the present low price of plastic recycling is a temporary blip caused as much by the US vs. China trade war as any fundamental in the market including the present abundance of natural gas condensate. Unless it is burned the plastic can sit in landfills or stockpiles until such time as the market recognizes it's value and it returns to the production stream. Lest we forget the bug experts have now discovered half a dozen worms with gut bacteria that digest PE and PS plastics for energy. By rights if the plastic is too cheap to recycle the logical course of action is to feed it to meal work larvae and feed most of the resulting grubs to poultry. Makes for lots of healthy hens laying lots of nutritious eggs, all based on a waste product and a little system engineering. Back 10 or 12 years ago in MO I discovered a hunk of EPS in a corner of the barn shot through with holes. At first I thought maybe gasoline had spilled on it or something, but when I picked it up it was full of mealworms! Freaked me out. That was the end of me ever thinking of building with EPS, ICFs or whatever. Um, if you're planning on future shortages, at least relative to today, wouldn't it be a whole lot simpler and more profitable to just buy some good energy companies, collect the dividends, and then sell when prices react to the relative shortage? How many houses would you have to stuff full of plastic recyclables to make it worth the trouble? Tanada wrote: Lest we forget the bug experts have now discovered half a dozen worms with gut bacteria that digest PE and PS plastics for energy. By rights if the plastic is too cheap to recycle the logical course of action is to feed it to meal work larvae and feed most of the resulting grubs to poultry. Makes for lots of healthy hens laying lots of nutritious eggs, all based on a waste product and a little system engineering. Hmmm. Chicken, the meat fortified with plastic. Probably not the best marketing idea, but it it's profitable, industry will do it.